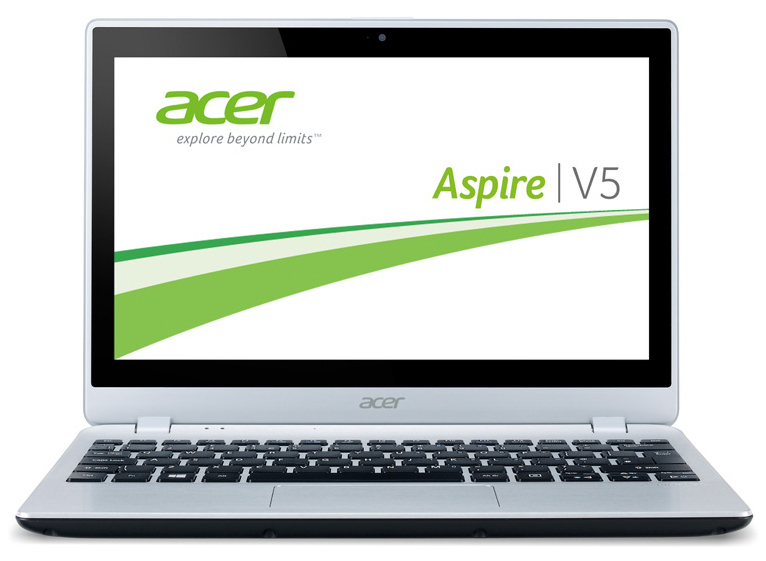 With the Aspire V5-132P, Acer presents the identically built successor of the Aspire V5-122P (AMD A6-1450, Radeon HD 8250). The devices only look alike because Acer has completely replaced the platform inside. While the Aspire V5-122P was still powered by a Temash APU from AMD, a Pentium processor from Intel is now used in the Aspire V5-132P. Surprisingly, Acer relies on an Ivy Bridge processor and not on a Haswell CPU. Our report reveals whether the small laptop benefits from the change of platforms. We used the Lenovo ThinkPad Edge E145 (AMD A4-5000, Radeon HD 8330) and HP Pavilion TouchSmart 11-e000sb (AMD A6-1450, Radeon HD 8250) to classify the laptop. We will not go in-depth about casing, connectivity, input devices, screen or speakers because the V5-132P is identical with the V5-122P. The corresponding information can be found in the review of the Aspire V5-122P. The V5-132P uses the same IPS screen as the V5-122P. However, the rates do differ a bit. This is normal because two identical screens never correspond to 100%. The manufacturer also has a bit of room in the settings. Acer makes an 11.6-inch subnotebook available with its Aspire V5-132P. The laptop has been built for tasks like browsing, typing, Skype, and video playback. Our review sample is sold for approximately 400 Euros (~$543). We did not discover other configurations. The Aspire is powered by a Pentium 2129Y processor from Intel. This dual-core CPU is still based on Intel's Ivy Bridge architecture and clocks with a speed of 1.1 GHz. It does not feature Turbo. Intel specifies a TDP of 10 watts. The CPU's full computing power is available in both AC and battery mode - as can be seen in the Cinebench CPU benchmarks. The Pentium outperforms the processor of both contenders and its precursor in single-thread applications. The three AMD processors have the lead in multi-thread applications. The system mostly runs smoothly. The weak processor is occasionally noticed, for example, when setting up file content. The Aspire achieves decent scores in the different PCMark benchmarks. It beats the ThinkPad Edge in the PCMark 7 benchmarks; we did not perform this test on the Pavilion. Acer furnishes the Aspire with a hard drive from Toshiba. It has a storage capacity of 500 GB and spins with 5400 revolutions per minute. The rates ascertained using CrystalDiskMark are within a range that we presently expect from a 5400 rpm hard drive. Intel's HD Graphics GPU is responsible for graphics output. The graphics core supports DirectX 11 and clocks with speeds ranging from 350 to 850 MHz. The ThinkPad Edge supplies the best scores in the 3DMark benchmarks. It also features the strongest GPU. 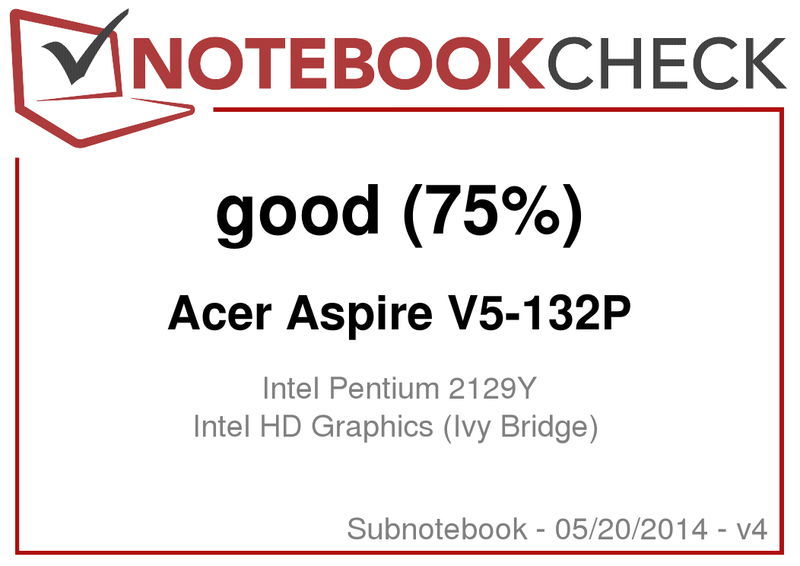 Even the Aspire V5-122P achieves better scores than its successor. The little laptop is not intended for computer games. Only a very few titles run smoothly on the computer - using a low resolution and low quality settings. The fan spins very slowly when idling and is virtually silent. However, the hard drive's access noise is very audible. The fan spins faster when loaded and enters an audible range. However, it is still tolerable. The V5-132P wins against its precursor in the comparison. It operates quieter over the entire load range. None of the three comparison laptops heat up excessively. Their surface temperatures are always within an acceptable range on every measuring point. The Aspire performed the stress test (Prime95 and Furmark run for at least one hour) in AC and battery mode in the same manner: The processor clocked at full speed (1.1 GHz). The graphics core was throttled to 350 MHz. 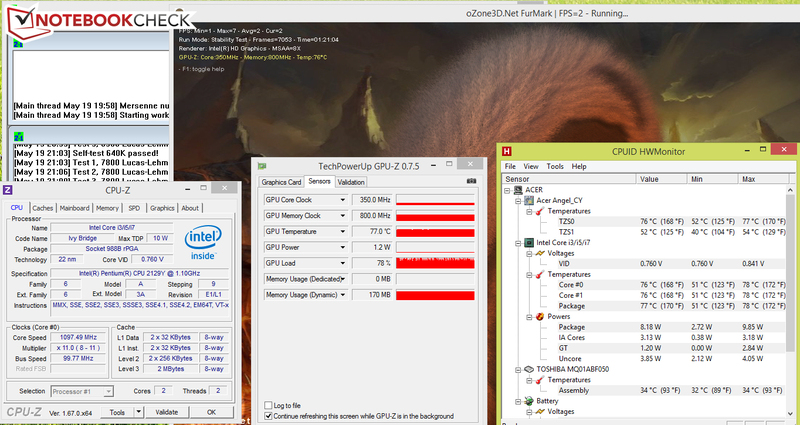 The CPU's temperature settled to approximately 77 °C in the stress test. (+) The maximum temperature on the upper side is 35.5 °C / 96 F, compared to the average of 35.8 °C / 96 F, ranging from 22 to 57 °C for the class Subnotebook. The Aspire's power requirement is on the level that we know from subnotebooks based on ULV hardware. The power consumption has been reduced slightly compared with the Aspire V5-122P. Websites are opened automatically every 40 seconds in the Wi-Fi test. The energy-saving profile is enabled, and the screen's brightness is set to approximately 150 cd/m². The Aspire achieved a runtime of 2:54 h - which is not an impressive time. The ThinkPad Edge (7:44 h) runs a lot longer, and even the Pavilion (4:32 h) is more enduring. Acer offers a secondary battery for both its V5-122P and V5-132P (model: NP.BTP11.00G), which is attached via screws to the underside. We had difficulties finding the battery in shops, but we discovered the battery on a well-known auction website. The battery costs around 100 Euros (~$135). With its Aspire V5-132P, Acer offers a subnotebook featuring hardware that makes it a portable typewriter and browsing machine. Unfortunately, the short battery runtimes ruin the claim on mobility. Only the optionally available battery could help here. Positive traits of the Aspire are - like its precursor - the design and the viewing-angle stable IPS screen. However, the screen is not very bright. The direct comparison between the Aspire V5-132P and the former Aspire V5-122P is mixed. The V5-132P sacrifices GPU power and multi-thread performance in favor of single-thread performance, as well as lower noise and temperature development. Our review sample was assembled in February 2014. Therefore it is surprising that Acer still installs an Ivy Bridge processor. The Aspire would have benefited considerably more from a Haswell processor, especially in terms of power requirement. Lenovo's ThinkPad Edge E145 is clearly a better typewriter and browsing machine than the Aspire. It features a very good keyboard, offers long battery runtimes, and it has a matte screen. HP's Pavilion TouchSmart 11-e000sb does not really have a unique selling point. In Review: Acer Aspire V5-132P-21294G50nss (NX.MDSEG.008). Test model courtesy of Notebooksbilliger.de. The casing and the low temperature development. Acer replaces the AMD APU with an Intel processor. Lenovo ThinkPad Edge E145, HP Pavilion TouchSmart 11-e000sb, Asus F200MA-CT067H, Lenovo ThinkPad Edge E130, Lenovo ThinkPad Edge E135, Acer Aspire V5-131, Acer Aspire V5-122P, Medion Akoya P2211T (convertible), Toshiba Satellite NB10t-A-101.